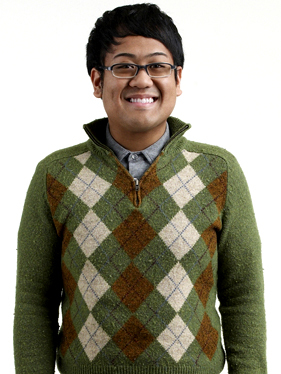 Jonathan Cruz is now a contestant on the CW’s “Beauty and the Geek.” I hope he wins. ‘Wal-Mart for Jesus,’ aka Mardel, doesn’t sell Halloween costumes. They just have Christian “dress-up” stuff (seriously, I received an add in the mail yesterday). Halloween is too offensive. We don’t use that word. Halloween has demons and goblins and vampires and ghosts and other things that are contrary to Christianity. But dressing up like a Christian crusader is not offensive. It’s okay to kill the infidels who don’t believe in Jesus like me. We need to to take back America from the infidels, too! 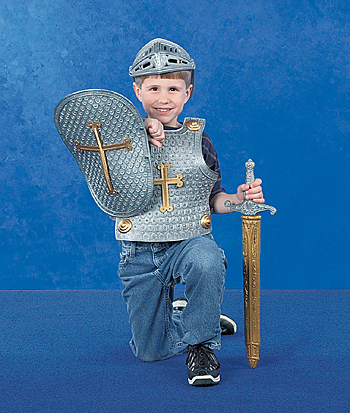 Let’s teach our kids to be soldiers for Jesus! All that peace-making talk in the Sermon on the Mount just isn’t all that useful. I mean, really, who actually “turns the other cheek?” What good does that do us Christians? It certainly doesn’t get us ahead in the competition for prominence in today’s world. So I say we forget all that peace-making talk in the New Testament and turn back to the good ol’ days of war-mongering in the time of Joshua and the Judges! And rather than look to Jesus as our example, let’s look to the Medieval times where chivalry was the rule of the day! careful disclaimer: I’m sure the people who created these costumes meant well, but, geez, we need to think these things through…. I mean, not only do I kill fish either at a lake or in the ocean when I want to eat them (i.e., when I go fishing), but I kill them within my home as well. Here’s what I do: I go to Petsmart, buy three or four fish, and take them home to my 10 gallon, (apparently) poisonous tank. My goal in life is to kill off all of Petsmart’s tropical fish population, three at a time, once a week. But you’ve gotta admit, it’s a pretty good strategy, killing these fish three at a time. I make the Petsmart people “think” that I actually want to buy and keep their fish. I even bring a sample of my water, and I even go to the extent of asking why my fish keep dying (suckers). The strategy works perfectly because they tell me that my water is perfect for keeping fish, and that they don’t know why my fish are dying. Little do they know I have planted an undetectable poison in my tank to kill off their precious fish. And they actually sell them to me!